Samosa is a delicious small triangular fried snack originally from northern India. The most favorite tea time snack across India available in almost in every tea stall. An easy to prepare aloo samosa that makes a delicious, inexpensive brunch. Take a pan and heat the clarified butter to melt on low flame. Cook it till it melts (do not over heat it we only need melted clarified butter to prepare the dough). Take a large bowl and combine refined flour along with cumin seeds and salt and mix well. Then, add melted ghee to above mixture and start kneading. Add lukewarm water in parts and knead to make a stiff dough with water. Cover the dough with a moist cloth and keep the dough aside covered for 10 minutes. Peel the boiled potatoes and crush them into large lumps. Heat oil in a non stick pan, add cumin, when crackling add the onion, ginger and saute and cook for 2-3 minutes over a high heat. Add the peas, stir well and add the spices, mango powder, salt and a splash of water so that peas gets little soft and fried. Cook for 1-2 minutes. Then add the potatoes mix and saute then cook for another 4-5 minutes. Sprinkle the coriander leaves, mix it well and set aside for cooling. Divide the dough in equal parts, shape it into a log and slice it into equal parts. Each part should be sufficient to make 6-inch size poori. Roll each part in your palm to make balls and place all the balls in a some bowl and cover it with moist cloth. Dust the rolling board lightly with some flour. Roll each ball with the rolling pin to make a small oval shape of around 4 inch wide and of 6 inch length. Cut it into half to form a half moon shape design of 4 inch wide and of 3 inch length and keep is in a plate covering it with moist cloth. Repeat this process with all the dough balls to form rest samosa covering. Take a half moon shape design samosa covering. Apply little water on the straight edge of the half moon samosa covering with your finger tip. 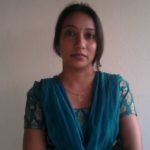 Hold the samosa covering in your hand, fold the straight edge and seal the watered edges pressing it between your index finger and thumb with other hand to form a cone shape triangular pocket. Take the filling and stuff the prepared mixture in the cone, and then seal the upper edges again applying little water on the open edges and pressing lightly with your finger. Repeat with the rest samosa covering. Heat oil in a pan till medium hot, to check drop a pinch of dough in the hot oil, if it comes up briskly and quickly then oil is sufficiently warm to fry the samosa. Gently slid the samosas in oil. 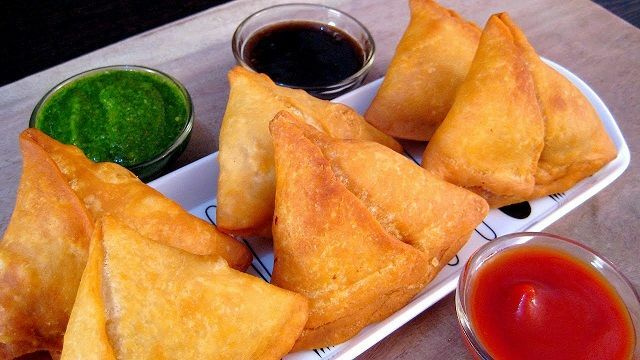 Just add as many samosas as fit in comfortably and turn the heat to low flame, after 2 minute of adding samosas in oil and deep fry them till the samosas turn light golden. Turn the flame to medium low until the crust becomes crispy and golden. Drain the samosas from oil and shift it over kitchen tissue to remove extra oil. Repeat this process for rest of samosas, increasing the heat for a few seconds before adding the next lot. 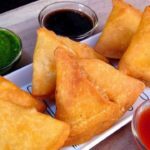 You can serve the deep fried crispy samosas to your family or guest as hot or at room temperature, as per your choice with green chutney or sweet and sour tamarind chutney or tomato sauce.